As gooseberries were starting to ripen and I also had half a bottle of elderflower cordial lurking in the fridge, I started to ponder how to combine them. 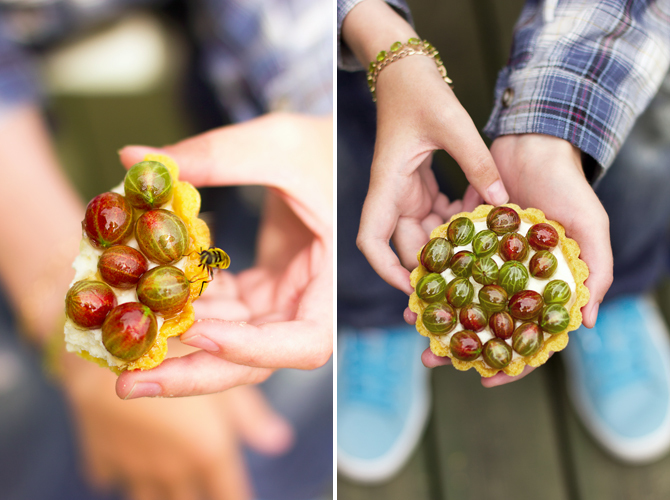 I put my thinking cap on and the idea was born - mignonne elderflower and gooseberry tartlets. Buttery pastry cases filled with elderflower mousse and topped with gooseberries dipped in elderflower geleé. Best to use homemade cordial because it has so much more flavour! A wasp also wanted to take a bite while I was eating the first tartlet. Sieve flour into a bowl of a food processor. Add sugar, salt and butter. Whiz until coarse crumbs form. Add the whisked egg yolk and whiz for a few more moments. Place the pastry on a lightly floured surface and knead for half a minute. Wrap in cling film and place in the fridge to chill, for about 20 minutes. Preheat the oven to 200C. Roll out the pastry to a thickness of about 3mm. Take a 13cm cutter and cut out 6 circles for six 10cm tartlet tins. You might have to use scraps for the last one. Blind bake the cases for 15 minutes, remove the parchment and bake for 5 more minutes. Let cool. Soak gelatine in cold water. Heat the elderflower cordial to about 40C-45C. Mix gelatine into the warm cordial until melted. Whisk double cream and the egg white to stiff peaks, in separate bowls. Add some caster sugar to the egg white when half way there. Mix cordial with the curd cheese. Gently fold in the whipped cream and egg white. Let stand in the fridge for about 25 minutes. Use a piping bag to generously fill the pastry cases. 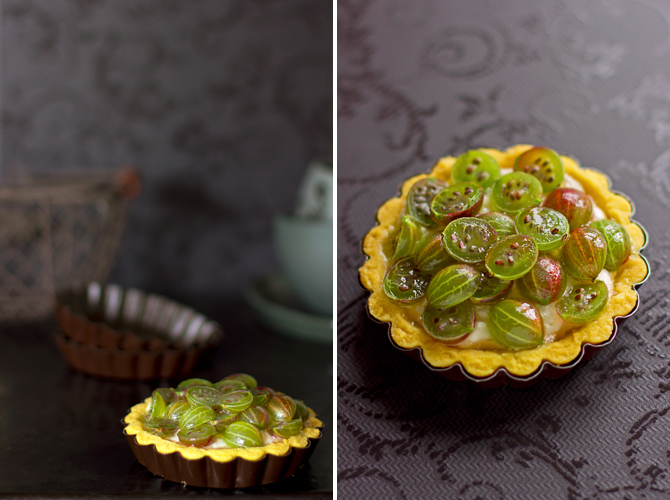 Top with ripe gooseberries. Place in the fridge or freezer to cool. Soak the gelatine in cold water. Heat half of the cordial. Mix gelatine into the warm cordial until melted. Add the rest of the cordial. Cool. Take the tartlets out of the fridge/freezer one by one. They must be cold in order to jelly the geleé right away. Drizzle the cooled cordial over the cold tartlets, slowly, covering every berry. There should be a tablespoon for every tartlet. Place back in the fridge until ready to serve. A low key shot for once :) nice. Never seen these fruits myself. 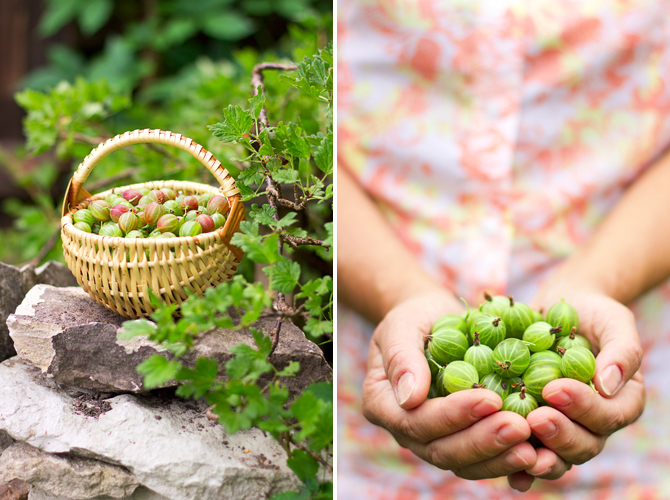 To me, gooseberries seem like prehistorical fruit, like crocodiles of the orchard, thorny climbers. Might as well be called thornberries! Imelised meeleolud ja võrratud pildid! I love your dessert...the picture was spectacular and drew me in from Tastespotting... great job! Your post is much like a summer breeze... Love !